Construction in Shanghai continues unabated. I mean, holy freakin’ crap. 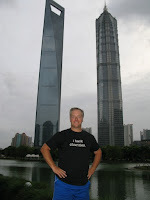 My last trip to Shanghai was about ten months ago. While a ton of new buildings have opened in the interim, the mad rush to complete multiple new subway lines looks pretty much the same as my last trip--frenetic--as does the typically massive amount of construction. When China decides they’re gonna do something, they do it. And, just as the building pace was ridiculous in the fall of 2006 on my last trip to Beijing (ahead of the Olympics), Shanghai is working 24x7 in advance of Expo 2010. Anton and I spent the day as tourists today. Since my travel typically consists of getting into a city at night, having meetings throughout each day, and dinners each evening, I’ve experienced very few tourist sites, despite the number of cities and countries I’ve been fortunate enough to visit over the last two decades. Today was a pleasant change. We started with the Catholic cathedral, the biggest and oldest Catholic church in Shanghai. The architecture was pretty simple compared to a lot of churches I’ve seen around the world, but it fit the mold for a cathedral--built in the shape of a cross, with high, arched ceilings, and a mix of random folks touring (us), as well as those enjoying a contemplative moment. Next, we visited two other places of worship--Pacific Digital Mall and Best Buy. (Yes, I know I’m a heretic, and yes, I know I’m going to hell.) Pacific Digital Mall was the typical high-rise Asian technology mall--tons of vendors hawking their wares, with a large number of real products (such as HP, Lenovo, and Apple) at authorized resellers; a large number of gray market products (such as three-year old wireless access points whose boxes weren’t written in Chinese, and cell phones four and five generations old); and out-and-out fakes, both hardware and software. Since neither of us were looking to buy anything, this didn’t phase us a bit--we were there to see the state-of-the-art in Chinese consumer technology marketing, not to try to find a bargain. Aside from the knock-offs themselves, the key things that came off as cheap were the sales and marketing techniques. I’m used to Yodobashi Camera and Bic Camera in Tokyo, where young men and women yell through bullhorns from open to close, trying to entice you to check out their products. But, marketing to Chinese consumers isn’t nearly that sophisticated. One of these days, I’ll get around to investigating more about the psychographics behind Chinese consumer marketing and branding. But, to the layman (and confirmed by multiple Chinese-American colleagues), purchase decisions are for the most part based on three criteria: price, price, and price. Since we’d seen all we needed to at the technology mall, we headed a couple of blocks down the street to Best Buy Xujiahui--Richfield’s first foray into the Chinese market. 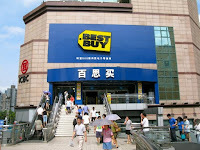 Best Buy now has seven stores in Shanghai, but Xujiahui was the first. The store had everything you’d expect out of a flagship Best Buy store, including cutting edge flat-panel TVs, excellent demo rooms in the Magnolia Hi-Fi store-within-a-store, and a large Geek Squad area, reminiscent of one of Apple’s Genius Bars. They also carried items I didn’t expect, including Toto and Panasonic’s *awesome* high-tech toilet seats; water heaters from the Midwest’s own A.O. Smith; and an entire range of appliances from both well-known western brands as well as Chinese marques. After my annoyance at the lack of marketing sophistication and brand differentiation at the technology mall, Best Buy’s merchandising was refreshing--products were given space to breathe, were presented in an organized fashion, and were most importantly current. The Blue Shirts were a lot more clingy than I prefer salespeople to be, but knowing the effort that BBY puts into research and training, I can conclude that their clinginess is exactly what the doctor ordered for the local market. I’m curious whether each of the seven Shanghai stores has its own character based on demographic target (anyone remember Barry & Jill or Ray & Maria? ), or if the stores are relatively cookie cutter. While most of the Blue Shirts speak survival English (similar to my taqueria Spanish), I really couldn’t dig into a conversation about store types, so that’s another note to self. Another thought occurred while we were walking around. The difference between Best Buy in Shanghai and Fry’s in Silicon Valley? The sales people and cashiers working at Best Buy speak better English. After leaving BBY, we hopped in a cab to the Jade Buddha Temple. I mentioned a few things on our ride over--shifting patterns, taxi costs, and general traffic chaos. First off, I’m always amazed by the way that Chinese drivers go through the gears. Cars and buses almost always (>99.999% of the time) start in second gear. First appears to be vestigial, the appendix of Chinese manual transmissions. Seriously, I think that first is used only when driving vertically. Second is used to get rolling, at which time drivers cycle through the gears to get into the highest gear as soon as possible, damn the (non-existent) torque band. I need to find a Chinese drivers education teacher (or perhaps a mechanic) to have a philosophical discussion on the topic...ideally over a Tsing Tao or three. Secondly, Taxi costs are mind-bogglingly low. Last year in Shanghai, I hopped in a cab to head out to meet a colleague; unfortunately, the location we were supposed to meet was translated for me incorrectly, so I ended up on a less-than-excellent-adventure through much of Shanghai. An hour and twenty minutes later, after multiple phone calls to try to figure out exactly where the heck I was trying to get to, I finally reached the correct destination. A ride like that in any U.S. city, covering the distance I did, would’ve easily run me $100-150. In Shanghai? Less than ¥150...not even twenty bucks. I swear that the guy burned that much gas while running me around, much less the wear and tear on his transmission from all those second gear starts. Gas prices here are pretty similar to U.S. gas prices, so all I can figure is that taxi drivers must receive some type of gas subsidy...a good question to ask while I’m here. Finally, I’m forever amazed at the way vehicular, bicycle, and pedestrian traffic works here in China. Although I haven’t spent time in the Third World, I’ve seen some pretty crazy driving styles in places like Mexico City and Madrid. And, uh, Boston. But, China is its own beast. All I can compare it to is Wi-Fi transmission--CSMA/CA, Carrier Sense Multiple Access with Collision Avoidance. (Yes, I know I’m a geek.) Just as Wi-Fi radios utilize the shared medium of an access point by throwing bits into the air with a defined but random mechanism, so too does Chinese traffic manage to live, thrive, and survive. If you haven’t been here, on your first trip you’ll watch slack-jawed at the near-crashes you’ll see on every corner, in the middle of each street, on the expressways, and even on sidewalks. Even if you’ve been here before, being a passenger is a little like an e-ticket ride at the Mouse House. And, since we don’t do a terribly great job of drivers education in the U.S., I can only imagine how the Brits and Germans feel when they’re here, since their drivers ed programs are dramatically more rigorous than America’s, and about as diametrically opposite to Chinese driving as one could imagine. By the way, the Jade Buddha Temple was cool. Next, our plan was to head to the People’s Park and People’s Square, which were too far to reach on foot. I suggested that we hoof it over to the subway, rather than taking the easy way out by hopping in a cab. On the way to the subway stop, we figured we’d stop to pick up something to eat. As we reached the Kerry Everbright City area, I realized that the McDonald’s dead-ahead of us was where I’d eaten breakfast each morning on my previous trip to Shanghai. Anton was jonesing for a Big Mac, so Mickey D’s it was. As multi-cultural as Xin Tian Di was last night, the McDonald’s was exactly what I expected--packed full of Chinese, with the two of us the only Westerners in the joint. We’d’ve experienced the same thing if we’d gone across the street to the KFC, the single most popular fast food chain in China, so I didn’t feel too guilty about lunching at Ronald’s...although I would’ve preferred a street gyro of random meat, which we weren’t lucky enough to stumble across. After wolfing down some food, we headed into the subway--Shanghai’s best bargain, even more so than taxis. Since Shanghai’s tube charges based on distance traveled, you purchase tickets accordingly. So, I punched our destination station into the ticket machine (which had a very well-defined English option); the screen showed a charge of ¥3 per ticket, or about 45¢ each. Sweet. Arriving at the People’s Square station a few minutes later, I felt like I was at Shinjuku Station in Tokyo--the main passageway level was new, clean, and extremely well-lit. Unfortunately, that was the highlight of the stop. Not to denigrate Shanghai, but having hung out at Tiananmen Square, I was a little bit underwhelmed. Back into the subway we went, heading across the river to Pudong and the brand spanking new Shanghai World Financial Centre. ¥4 each later, we reached the first stop in Pudong, where we popped up into a pedestrian’s nightmare--based on the footprint of the construction field, it seemed like the city was building an entire subterranean universe, but it was simply the pace of Shanghai, continuing unabated. The good news was, we could see the SWFC building from where we were. 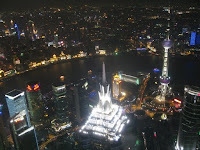 (Then again, at 100 stories high, one could see it from well beyond the edges of Shanghai if the sky ever cleared enough.) The bad news was, the path from A to B required detouring through the entire alphabet to get there, but we eventually made it. Crossing an eight-lane one-way street as our final test made reaching our destination even more worthwhile. Up we went to the 100th floor observatory, paying ¥150 for the privilege. I should probably do the math on the cost traveled per meter in a vertical direction (at the SWFC) versus horizontal direction (on the tube), but I don’t think that’s a very fair comparison. Might be neat, though. Scary, too. Not at all scary was the observatory, from where we watched the lights of the city come alive. We headed up at dusk; when the city's lights came on at 7 p.m., we were treated to a show that got brighter by the minute. We rolled out of the observatory, heading southeast to a different subway stop--one we could reach without running a gauntlet. Another ¥4 ride got us back to within a couple of blocks of the hotel. Transferring between the #2 and #1 subway lines at People’s Square, I was once again reminded of Shinjuku Station, this time even more so--the distance required to go between the two lines is roughly equal to the distance required to transfer between a regular train and the Narita Express at Shinjuku, the benefit here being that we weren’t lugging suitcases. When we arrived back at the hotel, Anton decided to crash, while I headed up here to the executive lounge. I’m pretty jaded as travel value goes, but I have to rave about the Marriott Courtyard Xujiahui. When we walked into the hotel yesterday, they whisked us upstairs to the executive floor, to check us in at the concierge desk in the executive lounge. I can’t think of a single Courtyard in North America which has an executive lounge, much less one open till midnight every night of the week, including Saturday. On weekend stays, I’m used to rolling into a hotel on Friday night, to be told that the lounge is closed till Sunday night or Monday morning, and being handed coupons for breakfast each weekend morning. But, it’s not the breakfast that’s important to me--it’s the ability to hang out in the lounge and decompress, enjoying the space so lacking in the typical hotel room (even though the rooms here are great). A huge thumbs up to the Courtyard Xujiahui, Marriott’s 800th Courtyard when it opened earlier this year.